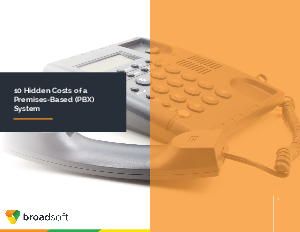 Many premises-based phone system (PBX) manufacturers claim that the five year costs of their systems are lower than an equivalent cloud alternative. What the premises guys don’t tell you about is all the extra little hidden costs that come as a result of the limitations of the hardware and software in their systems. This guide will provide you with useful questions to ask your PBX manufacturer to ensure that you're getting the full picture on the cost of their system. Have you sized this system for my peak demand? Have you factored in the cost of site redundancy? How many hours of call recording are included? How is mobility supported? Do calls route in an out of the PBX for call treatment? What are the annual maintenance costs of the hardware and software in this system? Which third party systems have you integrated this PBX with?